Yes, Yes, Yes. I have always had an extreme fascination with Radio's and radio communication. I simply think that it is cool to pick up a microphone and speak to someone miles and miles away. As a young boy I was very much into the CB radio craze. I used to ride my bicycle around town with a CB mounted on it and a homemade microphone and headset on talking to people around town. I was in a CB club called the Winery Walkers and we made our home channel, channel 5. I have always enjoyed the idea of HAM but could never get into the Morse Code side of it and thus, I never became a HAM operator. Now, many years later the FCC has lifted the code requirements and made it easier for people, like me, to become licensed HAM operators. 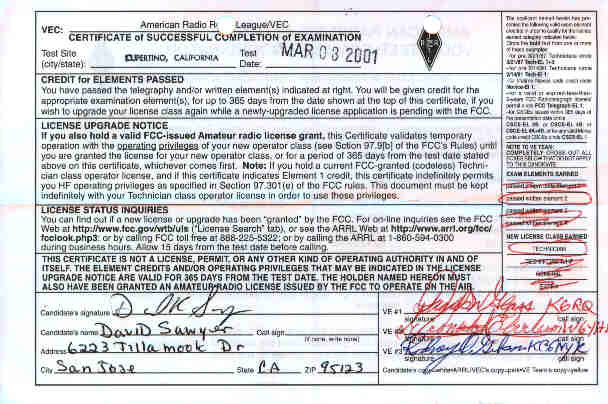 As of March 3, 2001 I have successfully passed my examination for Technician Class HAM operator. Even before getting my license I found and joined a group of people who have both the love of Motorcycles and the Love of HAM. My buddy Roger WB1CFQ was already a MARC member but since the mainstay of the organization was in Southern California he wanted to start a local chapter so BA-MARC was born. 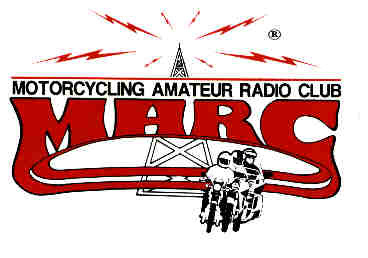 MARCÒ is an organization dedicated to the enjoyment of both Motorcycles and HAM Radio operation. They are very much involved in charities on a year round basis and it has new chapters starting all the time all over the nation. 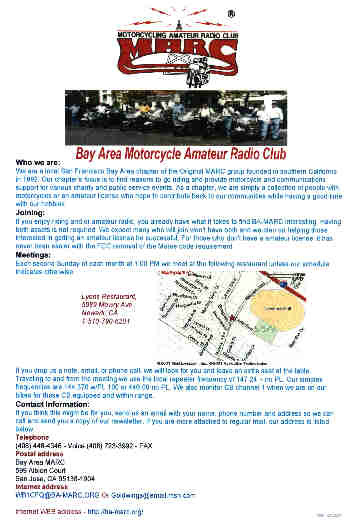 BA-MARC is already on the schedule to participate in many local chairity events and we, as a group, are looking forward to placing our Motorcycle Riding skills and HAM Radio operation to good public benefet use. Currently I am installing a Kenwood TM-V7 Dual Band radio on my 1998 Honda Goldwing SE. The radio is borrowed from my friend Roger WB1CFQ. I will be using the Comet Rhino Killer Antenna and I have just finished the final soldering work on a homemade audio interface box designed by Roger WB1CQF. Photos, descriptions and schematics will be forthcoming for that project so stay tuned. If you have ever had the desire to become a HAM operator now is the time. If I can pass the test then anyone can. As soon as the FCC grants my actual call sign you will be hearing me on the airwaves. CQ, CQ, CQ. My Number is in. I am very close to completing my Goldwing instillation and once completed I will have photos, schematics and details of the finished product.